Winter dinners are wonderful. One big bowl of steaming hot soup or stew filled with your favorite vegetables, grains, and maybe a little meat (if you are that way inclined). On the side, some crusty bread with a little butter. It is such a delicious and warming way to make sure you are reaching your daily vegetable quota, without having to munch on bags of carrots and snap peas. One of my favorite soup recipes comes from my mother-in-law. When I married her wonderful son, she gave me her recipe for lentil barley soup (because it was his favorite), and I have been making it ever since. The recipe is incredibly simple and extremely healthy. It contains lots of fiber from the lentils and barley, antioxidants from the tomatoes and garlic, as well as vitamins and minerals from the other vegetables. I have made two minor tweaks to the original recipe. I have replaced the butter with olive oil to take advantage of those heart-healthy fats, and I have increased the garlic to help boost my immune system during the winter sickness season. Other than that, this is the original lentil barley soup recipe that my mother-in-law has been following since the 1950s. In a dutch oven or large pan, heat the olive oil over a medium heat. Stir, cover, and cook gently until tender (about 5 minutes). Add the stock, tomatoes (undrained), lentils, barley, rosemary, oregano, and black pepper. Bring to the boil, then reduce the heat. Cover and simmer for 55 minutes. Season with salt and black pepper if necessary. I love anything with barley in it and most barley recipes always pair it with beef for some reason and I’m a vegetarian 🙂 Thank you for this delicious recipe! You’re welcome Brigitte. I hope you enjoy it. It is super easy to make, which is always a bonus. I saw the photo of your soup last night, and made a lovely, huge pot of it tonight. It tastes every bit as good as it looks! Thank you so much for posting this recipe. It’s very satisfying! Yum yum yum yum! Hi Chris. Thank you so much for your feedback. I’m glad you enjoyed it. This looks sooo good. 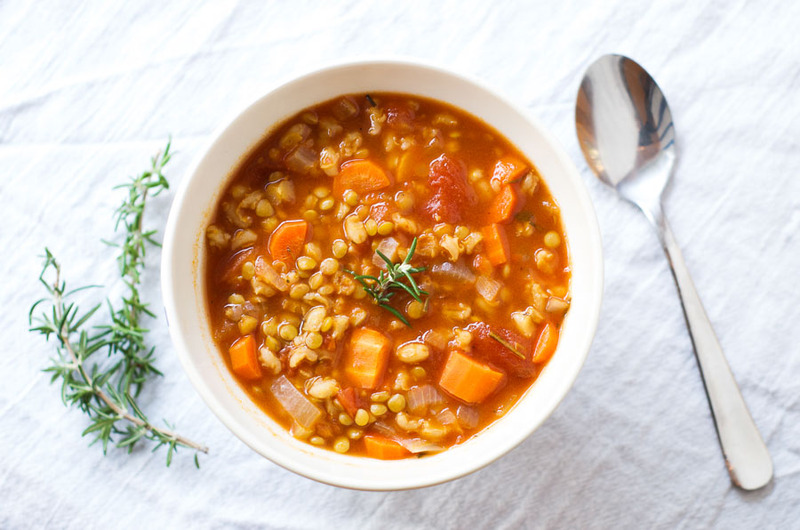 I love barley and vegetable soup – the lentils make a nice addition. I just made some homemade vegetable stock now I know what I will be doing with it! Thanks for sharing. Thanks Anne. I hope you enjoy it. Yum! 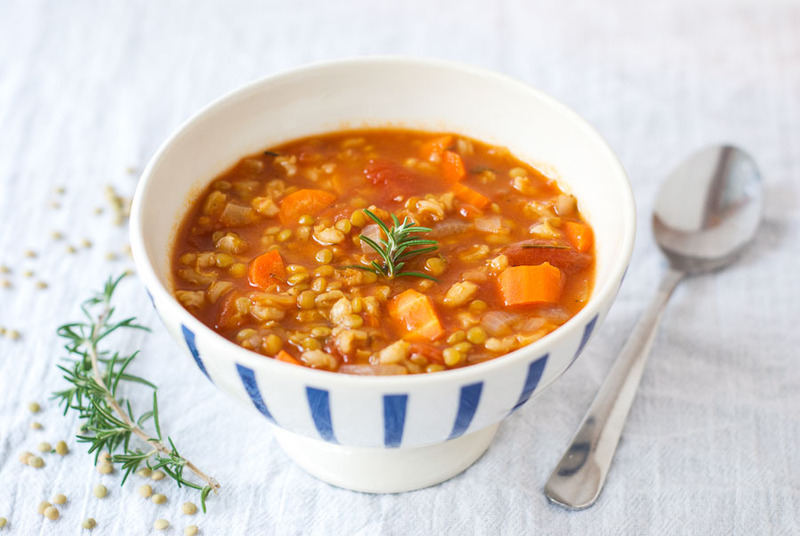 I do a very similar version with just barley, and love the addition of lentils. So easy for a weeknight dinner! Although I am dying from heat at the moment due to our lovely summer weather, you have managed to make me really want a bowl of this hearty soup! Looks fantastic, thanks for sharing. there really is nothing better than a hot soup in winter time! and this recipe looks absolutely lovely! i will give it a try! That’s so cool that this recipe has been in your husband’s family for so many decades – I love it when my food has a history behind it! This soup looks wonderfully hearty and delicious. I love lentils, so this is right up my alley! Hi, what kind of lentils do you use? Red, green, split or whole? Thanks, the soup looks great!! Hi Julie. Great question. I use whole green because they are my favorite, but you could use any lentils. Hi. I want to try this recipe but have not cooked with lentils much. If I use the whole green lentil do I have to soak them overnight or something first? Or do you just use canned ones? Or just throw dry ones in the pot for this recipe? No, you don’t have to soak whole green lentils before you use them. That is one of the great things about lentils – you do not need to soak them. You can just throw the dry lentils into the pot as per the recipe and they will cook with the rest of the ingredients. I would recommend dry lentils over canned if possible. I hope you enjoy the soup. It is great on a cool evening. 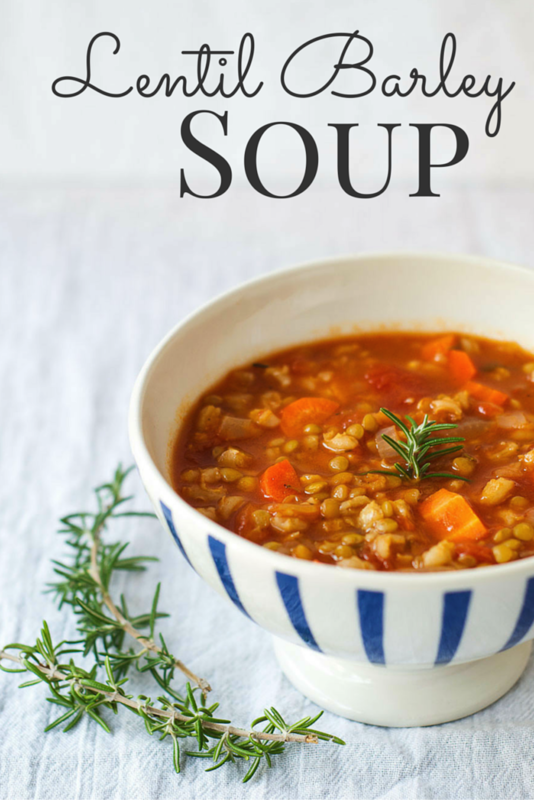 Just made this soup as I love barley, lentil, vegetable soup and it is just so delicious and hearty!! Do I need to double the measurement for barley and lentils if I am putting 2 cans of tomatoes? Please advise. Thank you! Do you mean 2 28-ounce cans? Yes you probably need to add more lentils and barley. Not a massive fan of rosemary – i put in 1/4 tsp oregano and a pinch of dried parsley instead and it was lovely! Holy Moly this recipe is delicious! I made it for dinner, then had it again for breakfast the next morning and it was even MORE delicious than the night before, and then dinner again! Like dance in my kitchen I couldn’t wait to eat it again kind of goodness. I used red lentils which melted and thickened the soup a bit, and hull-less barley which gave it an al-dente chewy goodness that I also liked, and crushed tomatoes – all because that’s what I had on hand. I found this on Pinterest and am so so so glad I chose to give it a try. I’ve officially printed the recipe and added it to my collection of keepers. Thank you from the bottom of my gut, lol, for sharing! Thank you for your lovely comment. I’m so glad you like it! It’s thanks to my mother in law for her delicious recipe! Hey! Do you think I could toss beef stew meat in without editing the recipe? Thanks! Yes I bet it would turn out great. I would throw it in early after you’ve softened the onions etc, brown it, then add the stock and tomatoes. You may need to add a touch more water. How long to cook this recipe using an instant pot? Have you (or anyone) tried to make this soup with an intant pot? Just made this for the 1st time and will definitely be making many more in the future. Delicious and nutritious. It only took 3 years but I finally made it tonight lol yum! Will be making it again. Very hearty. It works well in the instant pot. Sauté the veggies as in the recipe, then I did 20 minutes at high pressure, followed by 10 minutes natural release. Maybe it could have had less time, or skipped the natural release, as both the barley & the green lentils were quite soft. I picked 20 minutes because the instant pot chart shows 20 for barley, and some lesser figure for lentils. Anyway we ate seconds as we liked it so well. We did add greens at the last minute, and 2 t. sherry vinegar to liven it up. And harissa to add at the table. Very good recipe. A keeper!